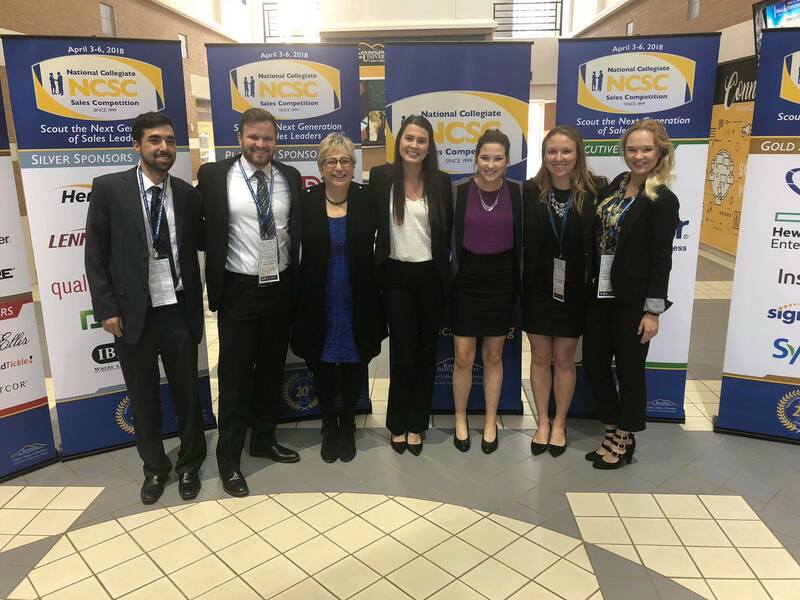 Cal Poly placed in the top five in the National Collegiate Sales Competition (NCSC) and business administration senior Alexis Anderson placed third overall. Both wins have never happened before. Lisa Simon, a marketing lecturer in the Orfalea College of Business (OCOB), is responsible for finding students to take with her to participate in the competition. Along with fellow business administration senior Taylor Curtiss, Anderson represented Cal Poly. The NCSC is a sales role-play competition that took place in Kennesaw, Georgia April 2-6. It is a tournament-style competition in which competitors are placed into brackets and compete in rounds. Competitors are given a product to sell and act as an employee for that company. In each round, their objective is not necessarily to sell the product, but to get another meeting or make it into the next round. This year, participants were instructed to sell a product by the competition’s sponsor, Gartner, an industrial technology and consulting expertise. Seventy-two schools nationwide entered this year. With two participants from each school, 144 students competed this year. Unlike other universities, Cal Poly does not have a sales concentration, sales major or sales minor offered to students interested in pursuing a career in business. Simon’s course Senior Project: Sales Development Program (BUS 466) is the only exposure to sales students like Anderson can have. The class helps students develop selling skills through sales role-plays. Students learn what to say as an objection to a client’s objection and how to back themselves up through numbers and testimonials. At the end of the quarter, students partake in a mock sales competition, and the winner goes with Simon to the NCSC. Anderson is grateful for the experience as it has reinforced her decision to pursue a career in sales. Currently, a sales minor is in the works to be introduced to the course catalog in 2019, and Anderson hopes other students will take advantage of that opportunity. “It’s exciting to know that for the future generation of Cal Poly students, if they do have an interest or a dedication towards sales, that they can have those tools here to pursue that interest and to learn more,” Anderson said. Both Anderson and Simon echoed a hope that students outside of OCOB will take advantage of the sales minor.